New to the Fabienne Jouvin Collection...Sea Life Cloisonne Covered Jars. The art of cloisonne...Sea Life Cloisonne Covered Jars. 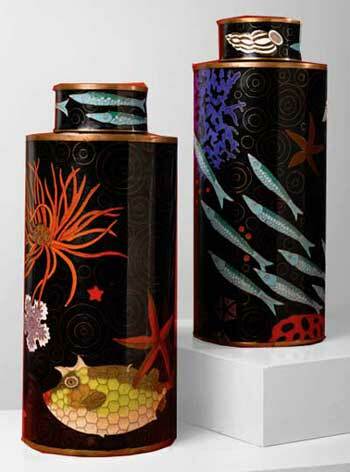 Contemporary in design, these Sea Life Cloisonne Covered Jars represent a 2000 year old art form! An accomplished artist & designer, Fabienne Jouvin has had a passion for mixing cultural designs ever since she roamed the world from China to Cuba. Fabienne traveled to the villages where her ceramics are spun, hand painted, & works directly with the crafts people to create unique designs. By immersing herself in the Asian culture, she is able to fully utilize the talents & abilities of the local crafts people. The result is a fabulous collection of ceramics with themes & colors that are soft, pleasant, & easy to live with. Fabienne Jouvin Sea Life Cloisonne Covered Jars by Tozai Home. 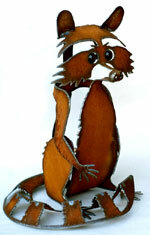 Size: 5 1/2" x 13 1/2"h.